Dsposal is a Manchester based company with a vision to revolutionise the waste industry by using technology to connect waste producers to licensed waste facilities and to simplify compliance. 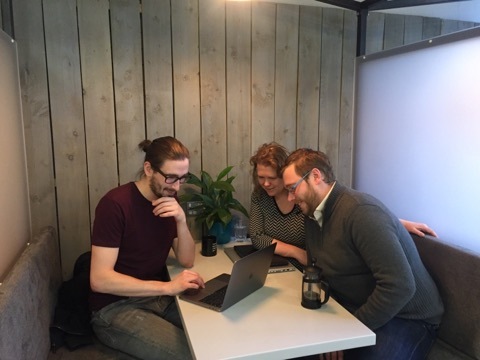 Below you can see a photo of our CEO, Michal having a meeting with Tom Passmore, the CEO & co-founder & Sophie Walker, COO and Co-founder of Dsposal. As a growing company they wanted to hire the best candidate who really fits into their company culture, therefore, we offered them our HR consultancy services. We mapped their company culture following our research-based assessment to define the core values of the business. We created the screening link used to assess candidates and see how well they fit within Dsposal’s specific culture. We created reports showing motivations of candidates and the specific impact on the unique culture of Dsposal. Using our software Dsposal was able to identify candidates who were more motivated and committed to working in their unique company culture. We captured the uniqueness of Dsposal by creating their unique core values profile. At Dsposal people are valued and supported while maintaining a truly innovative environment where people are free to experiment and learn from their own mistakes. Tom and Sophie ingrained their own values into the business and this is why the culture they created is very caring and holistic. Dsposal´s strong company culture underpinned by their values gives them a purpose and a direction that will help them realise their goal to be the hub for all things waste. They know the planet´s resources are limited, but they take this idea and extend it to include time, money, customers, suppliers and colleagues. What benefits have they received? Quicker and wiser decision based on culture fit.